Christina Tsaoussis of St. George (Media) beams as she raises her 1st Place medal. Christina was part of the Zephyros Senior (GOYA) Dance Group that claimed best Dance Performance for the second year in a row. In both junior and senior divisions St. George has claimed 1st place, two years running. Photo by Laine Koudelis. 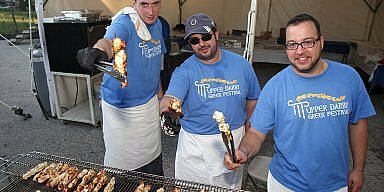 Annapolis, MD – Now, in its 27th year, the Hellenic Folk Dance Festival had 19 participating dance troupes from New Jersey, Pennsylvania, Maryland, and Virginia. The Greater Philadelphia Area was represented by dance groups from the three Delaware County churches; St. Demetrios Pegasus Dance Group, under the direction of Athena Putros, Eleni Agatsiotis, and Nakos Kyranos; St. Luke Broomall’s Olympians, under the direction of Christos Yiantsos; and St. George Media, which came with the Zephyrakia (Kindergarten – 2nd grade, HOPE), Zehyros Junior (3rd – 6th grade, JOY) both under the direction of Anthoula Psihalinos, and St. George Media’s Zephyros Senior dance group (7th – 12th grade, GOYA) under the direction of Philip Voutsakis. Numerous performances representing almost every corner of Hellenism were performed over the two-day event. The performances were judged by a panel of three judges, all members, and leaders of top-tier dance groups in New York City. Judging was based on the ethnic quality of dances, stage presence, precision, costume and director proficiency/level of difficulty. The Zephyrakia were not in a judged division but performed a spectacular set of dances from Epirus and Thessalia. Even at such a young age, the children showed a zest for dance and performance. In the junior division, St. George, Zephyros Juniors won first place for the second year in a row. A stellar performance of dances from Epirus, on Saturday, included a Tsamiko with a live clarinet intro by one of the dancers. On Sunday, they performed a set of dances from Kalymnos. Those watching were moved by an outstanding performance of the Kalymnian Mihanikos. This sponge divers’ dance shows the detrimental effect that the high pressure of sponge diving had on the young men of that island and also shows the dreams that those young men had to return to good health. 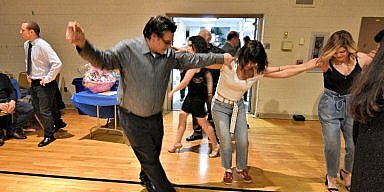 In the senior division, St. Luke’s Olympians showed their skillset in both Macedonian and Cretan dancing; Their Saturday performance included an exciting rendition of Leventiko, one of the most appreciated and exciting dances in Macedonia. On Sunday, their skilled dancers executed on the thrilling kicks and flips in Cretan favorites like Maleviziotis and Cretan Syrto. 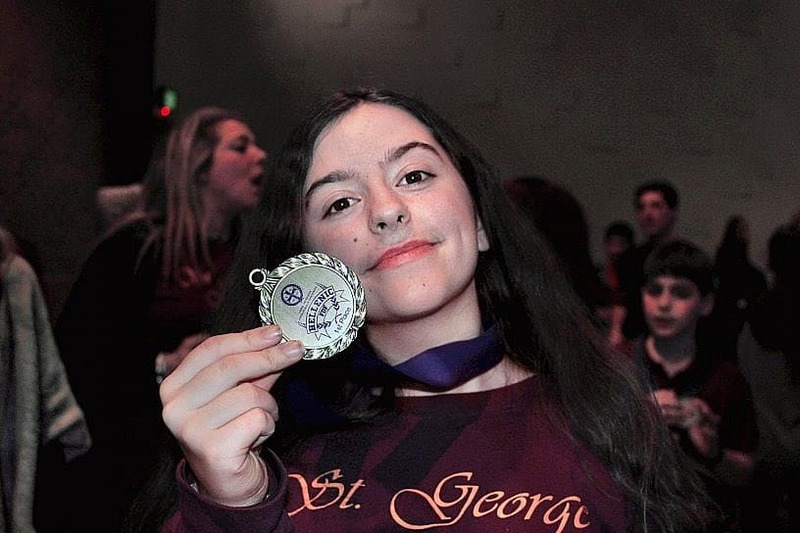 A tense awards ceremony in the senior division resulted in both St. Demetrios and St. George placing in the winners’ circle. Pegasus, in their first trip back to the competition in several years, displayed a spectacular rendition of dances from Pontos on Saturday, accompanied with live music by Yiorgos Sofianidis. That combined with an outstanding performance of dances from Central Macedonia, including the intricate Souleyman Aga dance from Edessa—a dance that progresses from slow and controlled movements to quick step reflecting jubilation. 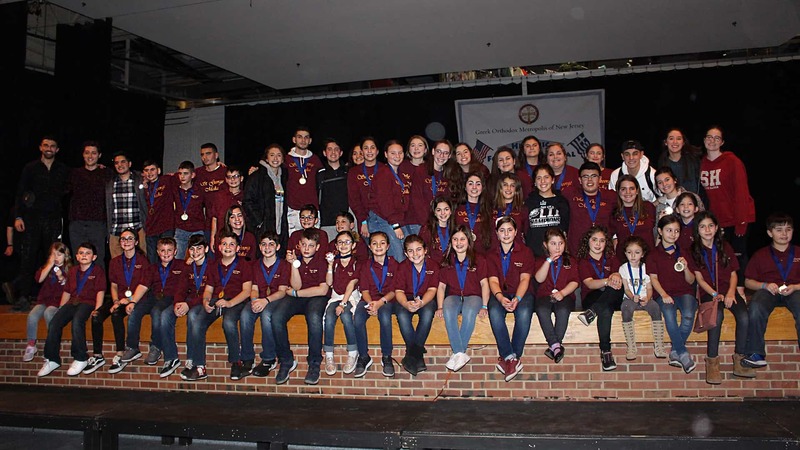 This earned them a tied 3rd place finish, along with St. John the Theologian Tenafly, NJ. 2nd place was won by the host parish, Sts. Constantine & Helen. The winner of the 10-group division, however, was St. George Media’s Zephyros Seniors. Just like the Junior group, this is the second year in a row that the Senior group won the competition. Their Saturday performance of dances from the Eastern-Macedonian villages of Monastiraki, Xiropotamos, and Volokas in Drama Prefecture was upbeat and unique and included the group singing one of the songs they danced along to. 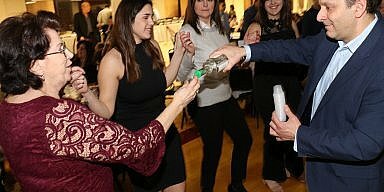 On Sunday, however, the group pulled out all the stops and performed a reenactment of a traditional wedding from Roumlouki—a 50-village area in the Imathia Prefecture southwest of Thessaloniki. The bride was wearing the sole white traditional costume and was covered in the stunning red veil; a visual focal point among the other girls in the group who were wearing the black version of the same costume. The osculation between the somber women’s’ dance Lypirida juxtaposed with the joyous Patina brought about a multidimensional performance. 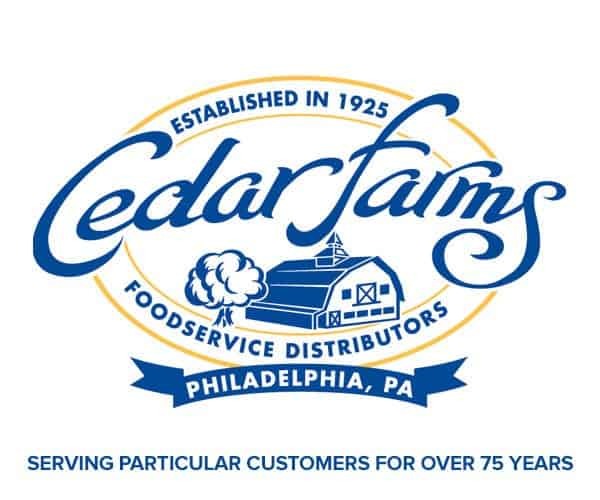 Zephyros was also awarded best costume in the senior division for the costume from Roumlouki, an award they shared last year with St. Thomas, Cherry Hill in 2018. Despite the intense competition, good sportsmanship and fellowship abounded. On Saturday night a banquet was held at Sts. Constantine & Hellen in Annapolis, MD. Through the evening Cretan and Pontian lyra players traded opportunities to play folk music which got kids, parents, and instructors from all the churches up dancing for hours on end. The Delaware County churches were particularly close all weekend with support, multiple group photos, and mutual congratulations were given. 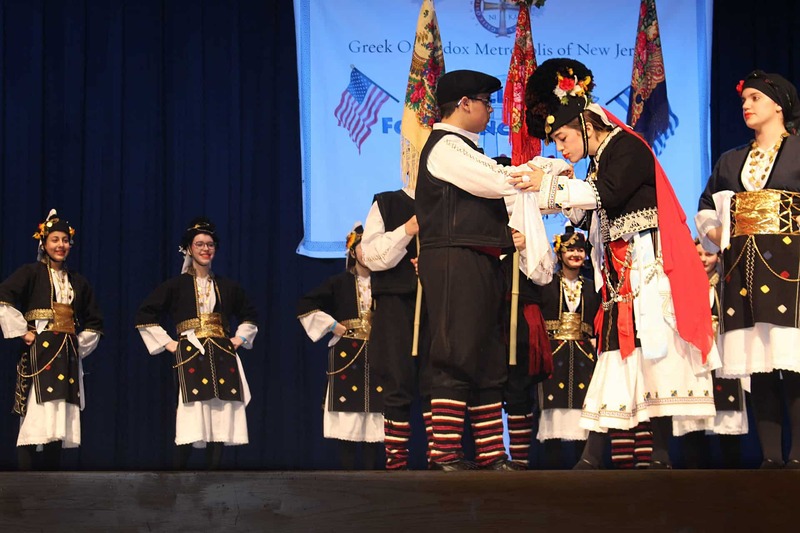 A strong fellowship between the three communities was felt throughout the weekend, while also displaying that that the Delaware Valley region is rich in kids who have an appreciation for Hellenic folk arts and enjoy putting on a great show!